2,500km and three months in and it seems like a good time to assess the merits of some of our gear. Our bikes (which are currently enjoying a well deserved rest on the balcony of our rented Budapest apartment) and accessories have stood up extraordinarily well to the test of long distance daily use over all kinds of surfaces, laden down with us and all of our gear. Barring countless punctures on the trailers and a few minor adjustments to gears, brakes and the like, the bikes have been no trouble at all. 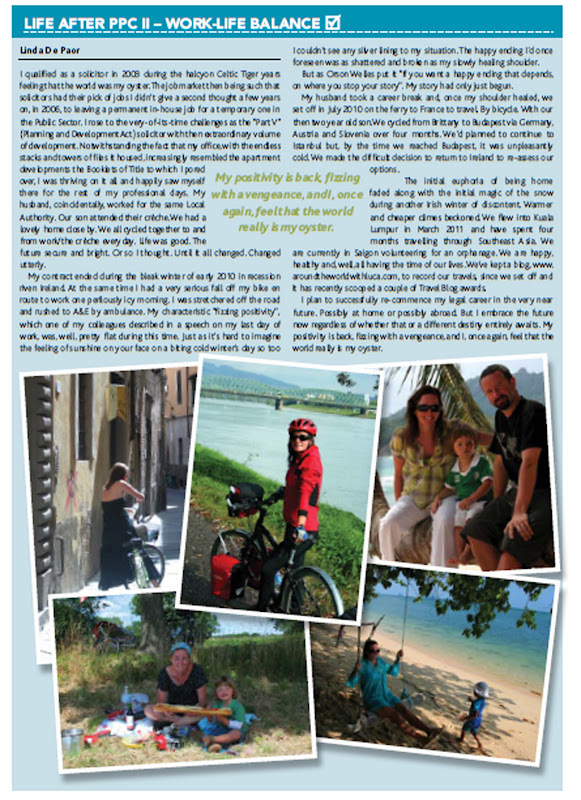 We got most of our cycling stuff in Cloughjordan Cycles and they certainly know their stuff when it comes to touring gear. 1) A proper bottle opener. The Leatherman corkscrew just isn't long enough and occasionally breaks the cork. A nuisance when endeavouring to open a nice bottle of claret! 2) A camping mallet. 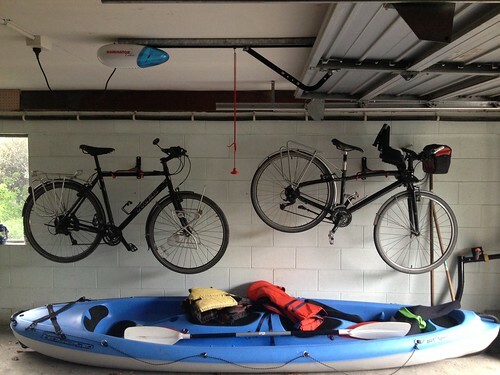 One might think it a ridiculously heavy and bulky item to carry on a bike, but it has been well worth it. Cursing at dry, hard ground and bent pegs are a thing of the past. Thank you German cyclists! Having said all that, we haven't been camping much lately, as it's been too cold at night to brave a tent with a two year old, so we've been lugging all the camping gear around needlessly. Tales from other cyclists we've met along the route, of dogs sniffing around their tents and freezing conditions haven't exactly made us miss camping! Not camping has put strain on our finances though, which is why we're having to consider a reroute. But, as the missus said, more on that anon. I've just re-read my posts from France, which now seem an age ago, and have wondered how I could possibly encapsulate all we have seen since into a post (I know I covered Germany but only cities and towns you may recall?) ? And then I realised that there is one theme which encompasses our cycling experiences through Germany, Austria, Slovakia and Hungary; autumn. One really experiences how marked the change in season when outdoors most of the day coupled with having limited clothes stock due to limited carrying capacity; you are completely at the mercy of the weather. In our neck of the woods autumn has now well and truly arrived and, in fact, winter has even begun to creep in. Cycling through the German countryside I couldn't help but recall the small town Kansas depicted in Truman Capote's "In Cold Blood". As we cycled through the rural residential areas the surroundings conjured up images of wholesome living in small, close knit communites where apple pies (or rather apfel strudel) lay steaming, waiting to cool, on window sills. I didn't actually see any such steaming apple pies, you understand, but they were all the time suggested by the neat, well tended gardens and the laden orchards housed therein. Even the cycle path was apple strewn....rendering it unavoidable to cycle over the windfallen ones at times. What a pleasure! It was in Germany that Luca first fell in love with the timeless children's autumnal game of collecting chestnuts. We were breakfasting on a picnic table in the campsite we were staying in outside Regensburg and chestnuts were literally showering down on us from the trees above helped by the squirrels jumping overhead. Gleefully and carefully they were gathered, examined, laid out in a line and counted by him. Over and over again. 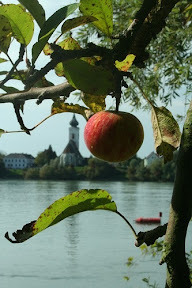 Having had our appetites for apples whetted in Germany we finally got an opportunity, in Austria, to sample the tantalising red variety we'd witnessed ripen over the preceeding weeks. There were lots of wild apple trees alongside the cycle track in Austria some of which were within picking reach and which we all thoroughly enjoyed on inpromptu stops. But the place which provided the biggest bounty of reachable fresh fruit ripe for the picking was the stunning Wachau wine region in Austria where there were tasty wild plums and apples aplenty. The Wachau was by far one of the highlights of our cycle trip, not just through Austria, but possibly thus far. It was a place untouched by time and progress, in a good way, where quaint, old villages lie intermittently through the vast expanses of vineyards. As far as the eye can see there are sloping terraces of vines which, we were informed by one wine maker, mean that machines can't be used so all of the wine picking etc. is carried out by hand in the old style. We witnessed this harvesting ourselves by people of all ages, as we cycled through on our last day there, against a backdrop of smoking old vines on hilltops. It is a special place which would be wonderful to visit in all seasons. In spring the apricot blossoms are abloom which is meant to be a stunning sight and in winter it would make for very a romantic, snowy and old world setting. But autumn brought the fertile earth there and its keepers' labours into their own. I am categorising these two countries together merely because we seem to be cycling one minute in one and the next in the other and so, for the purposes of countryside cycling, they have melded together in my mind. Vicous dogs barking and snarling from every second gate (literally) as we cycle, poor cycle tracks and some grey weather have made the cycling at times very hard going here. We got lost, for the first time on this trip, two days ago and found ourselves in very remote and agrarian surroundings. The kind that time seemed to have forgotten but not necessarily in a good way. Phil and I both had concerns that darkness would fall before we found our way once again. But it all worked out fine in the end thanks to Phil's great navigation. Little old ladies in head scarves peeking their heads over gates, small self-sufficient holdings and old men on bicycles - some of them with saws in their front baskets (possibly coming from work) - these are images of rural Hungary and Slovakia which will stay with me. But also the image of autumn leaves falling as we cycle and cycling over carpets of them. I love autumn and have loved seeing it evolve from our bicycle seats in so many different countries and manifest itself in so many different ways. But it has made me think of home. With some longing but also with some sadness. The latter because the rest of Europe seems, to me, to be enjoying their harvests while Ireland is experiencing very fallow years. Now I know, of course, other countries have suffered from the recession but Germany, for example, is now prospering twenty years post re-unification. The longing stems from memories of autumns past at home. Lovely walks kicking up leaves, the Farmleigh markets, the Sunday market in The People's Park and sitting at the al fresco cafe in Killiney Hill enjoying a hot chocolate. I think that, perhaps, I am starting to miss "a home" as opposed to home. We reach Budapest shortly and will assess our options going forward but both Phil and I are starting to think that a re-direction of some sort may be in order. More anon once we reach Budapest and reflect. For now - back on the bikes and back to those carpets of leaves. 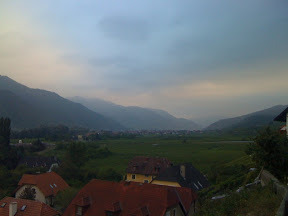 We've spent the last few days cycling at a very leisurely pace through the beautiful Wachau wine region. 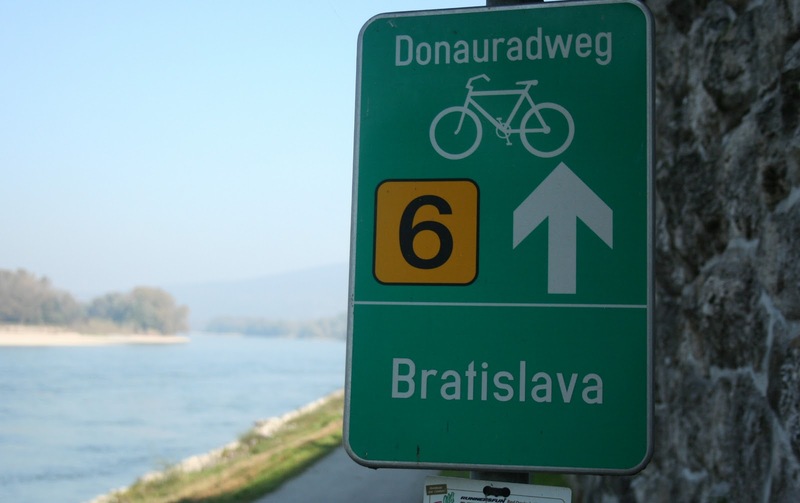 We had heard that it was one of the highlights of the whole Danube route and it didn't disappoint. It's stunning. The vines are set along steep hillside terraces, the little towns dotted throughout the region are picture perfect and the wine was delicious! As were the plums and apples we picked along the way. We also happened to be there during the first weekend of the grape harvest so every little town had a harvest festival, where brass bands played, pigs were roasted on spits and Sturm - a sweet, cloudy wine made from the first grapes of the season - was flowing. We met Linda's sister, Fran, there and spent a very enjoyable few days pottering around. We're only a day from Vienna now, where we're meeting my parents and chilling out for five days. From there, it's on toward Bratislava and Budapest.